Once again, Spain is making claims over Gibraltar. It would be worthwhile to give a quick sketch of the history of Gibraltar, showing why it is under British rule. We should first look at the origin of the name. In the later seventh century AD the first great wave of Islamic conquest swept right across north Africa to Morocco, and in 711 a Moslem army crossed the straits and routed the forces of the Visigoths, a Germanic people who had ruled Spain ever since the collapse of the Roman empire three centuries earlier. The Moslem commander, Tariq ibn Ziyad, named the landing-place after himself: "Jebel Tariq", "the rock of Tariq", hence "Gibraltar". The Moslem tide swept on through Spain and into France, and was only brought to a halt at Tours in 732. For the next few centuries, Islamic Spain was one of the great civilizations of European history, famous for its philosophers and poets (Jews as well as Arabs); and its magnificent buildings can still be seen, particularly at Cordova and Granada. The Christian reconquest of Spain began in the eleventh century, and lasted four hundred years. Spain was not a united country; its two principal kingdoms being Castile in the centre and Aragon on the east coast. Gibraltar changed hands more than once, but finally fell to the forces of Castile in 1462, and the reconquest was completed with the fall of Granada in 1492. Isabella of Castile married Ferdinand of Aragon, and a united Spanish monarchy was established. By 1700 Spain was in severe decline as a great power. In that year there died King Charles VI, imbecile and childless, leaving his vast empire to a relative: Philip, the young grandson of Louis XIV of France. The result was the war of the Spanish Succession. Alarmed at the prospect of an enormous French-dominated superpower stretching all the way from Gibraltar to the Rhine estuary, plus the Mediterranean islands and much of Italy, plus the huge overseas Spanish empire, Britain, Holland, the Austrian empire and various lesser powers formed a "Grand Alliance" to check French ambitions. The Catalans also rose in revolt against the rule of Madrid. The war is best remembered for the Duke of Marlborough's great victories over the French in Germany and the Netherlands, but in Spain Allied forces were less successful. A British army briefly occupied Madrid, but was then defeated and driven out. The war ended with the compromise peace at Utrecht in 1713. Philip became King of Spain; but a Spain deprived of its European possessions. Belgium, Sicily and much of Italy went to the Austrians, and the Duke of Savoy became King of Sardinia. Britain's share of the spoils was comparatively modest, but included Gibraltar and Minorca. Together they formed the base for a naval presence guarding the entrance to the Mediterranean. In the 19th century the opening of the Suez Canal made Gibraltar vital to British strategic interests, since the "spine" of the British Empire now ran through the Mediterranean and the Red Sea to India and Singapore. At the start of the 20th century Admiral Fisher named Gibraltar as one of the "Keys to unlock the world", along with Alexandria and Aden. Spain hit the international headlines in 1936 when the army under General Franco rose in rebellion against the Republican government. In the worst of all possible outcomes, the revolt was successful in the south, but the north and east, particularly the Basque and Catalan regions, remained loyal to the government, with Madrid on the front line. Three years of savage civil war followed. The official policy of the British government, with the reluctant support of the French, was "non-intervention", but inevitably other countries began to use the war for their own advantage. Hitler and Mussolini openly sent troops to fight alongside Franco. The Soviet Union supported the government; but the sheer forces of geography, plus Stalin's preoccupation with industrialization and the Purge, meant that Russian aid was far less effective. The British government pretended not to see these blatant infringements of non-intervention. 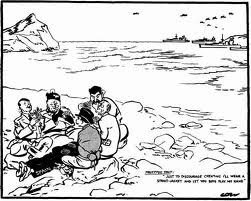 This cartoon by David Low shows Anthony Eden, the Foreign Secretary, playing cards on the prostrate body of Spain, alongside Hitler, Mussolini, Stalin and Leon Blum, the French Prime Minister. "Trustful Tony" is saying, "Just to discourage cheating, I'll wear a strait-jacket and let you chaps play my cards for me". Meanwhile in the background Italian warships and Nazi bomber-planes head for the rock of Gibraltar. George Orwell, who went to Spain to fight for the Republican government, was equally frustrated at his country's attitude; particularly those Conservative M.P.s who supported Franco even when British merchant ships trading with the Spanish government were sunk by Italian submarines. Was it not obvious to them, he protested, that a Hitler-backed government in Spain would seize Gibraltar and seal off the Mediterranean to British shipping? Indeed, in 1940 this is precisely what Hitler expected Franco to do. But Franco was too cautious, or too canny, to enter the war, and consequently he survived, though he was treated as a pariah for many years after 1945. And so Gibraltar survived in British hands, and remains so, since that seems to be the wish of the vast majority of its inhabitants. Any attempt to transfer territory against the wishes of the inhabitants (as, for instance, in the Falkland Islands) must be based on a "sacred soil" argument: namely, that the inhabitants have no right to be there, and therefore their wishes are of no consequence. I submit that such arguments are either drivel or very dangerous. Drivel because it is meaningless to say that any state has a "right" to take, against the wishes of the inhabitants a piece of territory which has belonged to another state for a considerable time (and, as we have seen, Britain has held Gibraltar for longer than it was held by Spain; though not as long as it was held by the Islamic Caliphate. Also, the Spaniards ruled Sicily for much longer than they ruled Gibraltar, but I see no sign of them demanding Sicily back). Dangerous because it postulates that the inhabitants of the territory, who may have lived there for several generations, have no right to be there or to decide their future (to give a notorious example: "This land belongs to us! It does not belong to the Jews! Sieg heil! ").